Actually I blame David Walsh for creating MONA. If he hadn’t done that, then we wouldn’t have felt like the only people left in Sydney who hadn’t been to see the wall of vaginas and none of this would have happened. So on behalf of David Walsh and Strop, I apologise for the yawning chasm that is the last month on this blog. It won’t happen again. Ever. I promise. Cross my heart, all of that. Never, ever. Ever. Before we were so rudely interrupted, I seem to remember a trip to a surprisingly enjoyable Indian restaurant. In terms of sub-continental cuisine on Enmore Road, Faheem’s Fast Food casts a very long shadow that hides all other curry joints. I had never noticed Shaahi Tandoori before this visit, but I’m pretty sure we’ll go back. Particularly for the Goat Curry and the Salted Lassi. Yummo. We sat at the front table with an excellent view of the buses roaring past, and the passing parade of pedestrian punters on their way to the Enmore Theatre. Tonight the crowd appeared to be predominantly of a certain age and greyness. Well, the men were, I suspect a bit of colouration was at work in many of the women’s hair. 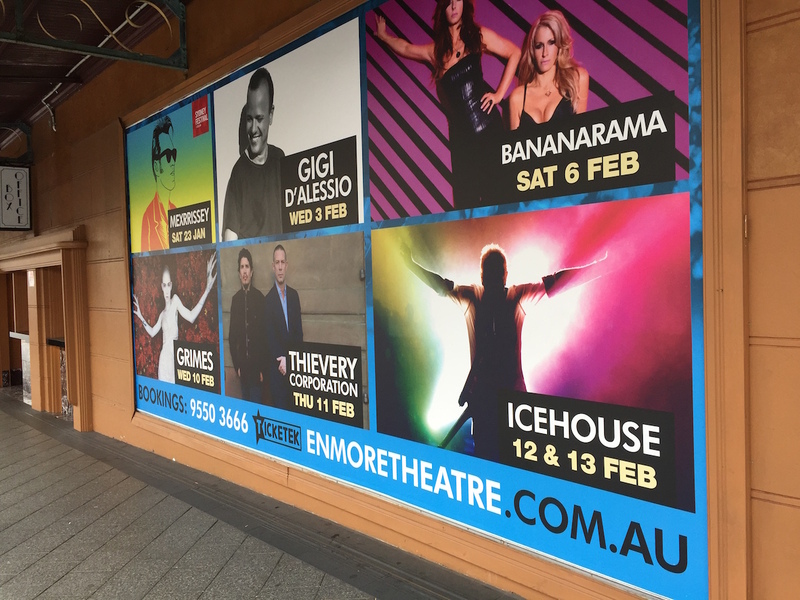 One of the entertaining things about a night out on Enmore Road is the changing nature of the street crowd depending on who is playing at the Enmore Theatre. A very sweet and attentive young woman took our order which included Paneer, Chicken 65, Aloo Mattar and Garlic Nan, as well as the goat and the lassi. 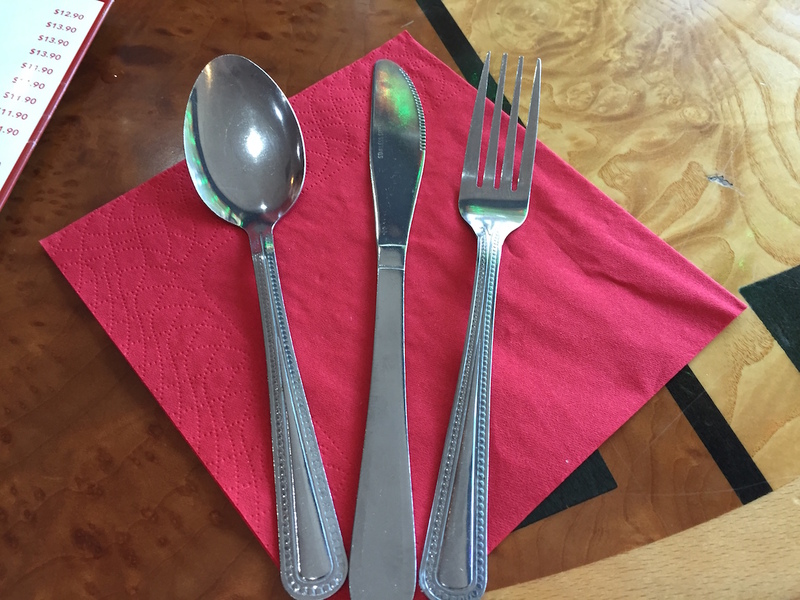 One of the problems we have found with dining on our own is that we want to try a lot more dishes than we can actually eat. We usually make a pretty good effort though, a clean plate is a good plate, but we pay for it on the walk home. 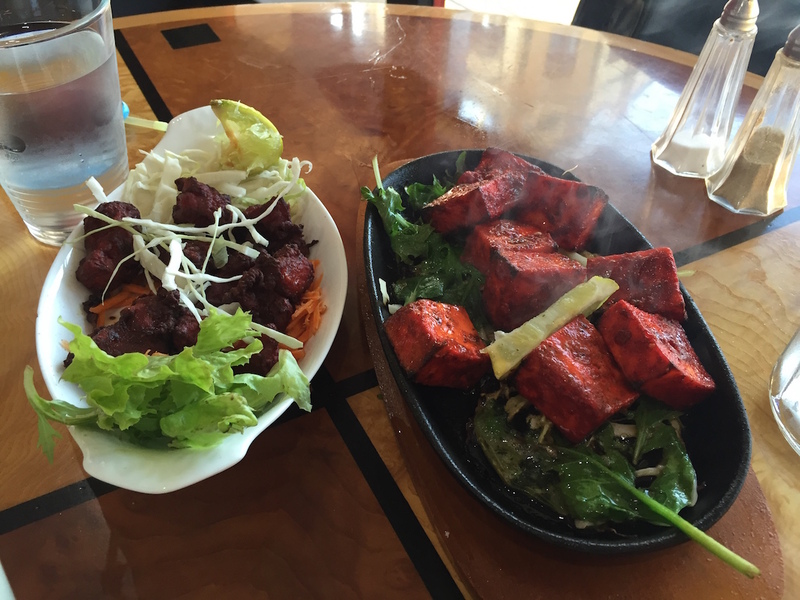 The Paneer was a bit heavy for my taste but the Chicken 65 was terrific. Basically fried chicken but with all the flavours. I’ll go back for that one too. The Goat Curry was dark, succulent and spicy. Lucky we had the Salted Lassi. I’ve never had it before and it was terrifically refreshing, as well as easing the effects of the chilli. While we were working our way through too much food, Strop caught a glimpse of a pair of nephews walking up the other side of the street. As she leapt to her feet and rushed out the door I took the opportunity to nab another piece of fried chicken. Strop waved and hallooed across the road, and Keir and Charlie waved back. I kept eating. Five minutes later Keir and Charlie showed up at Shaahi Tandoori. Apparently their family were just down the road at Cow and The Moon having a refreshing gelato. Young Charlie’s tolerance for watching his aunt and uncle eat food that he wouldn’t touch with a light sabre, was understandably low, so they didn’t stay very long. Strop and I were back to enjoying the food, trying to decide if we could discreetly undo our belts a couple of notches, when Keir returned. This time he and Charlie had Emma and Will in tow. While Em came and joined us at the table, Keir and Will, proceeded to put on a floorshow outside on the footpath. Enmore Road has everything you need for a night out. You can see part of the show here. When Charlie couldn’t stand it anymore, Em took her tribe and headed for home, while Strop and I wandered back down Enmore Road. At the Enmore Theatre the reason for the greying crowd became apparent. Icehouse were playing. Faheem’s Fast Food is next up on Enmore Road, I’m looking forward to the comparison. And now for the ratings: Accessibility – 5 Susans; Value – 4.5 Wendys.